Jaidis also owns and operates Juniper Grove Book Solutions, voted #1 Best Promotional Firm, Site, or Resource in the 2015 Preditors & Editors Readers’ Poll. Wyatt is drifting through life after his daughter is murdered by bandits. All he has now is his gun and his horse. He comes to a small town and Chuck tells him there are places where he can stay the night. Wyatt is also in time for the Harvest celebration. A young sixteen-year-old Matilda would take care of his horse. In the stable with sunlight on her, Matilda looks just like the daughter he had lost. He overhears Chuck and another man discussing that they should select someone young this time, and the man suggests Matilda. Wyatt could not believe what they actually intended to do with her. 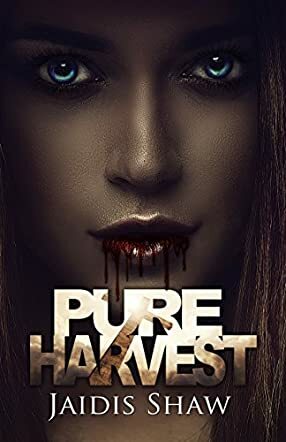 With Pure Harvest, Jaidis Shaw spins a macabre tale where a town celebrates a festival by sacrificing one of their own for a ghastly purpose. This is an unusual story and very well written. I would have enjoyed more elaboration on the town’s background and the strange people in it. Nevertheless, I found Jaidis Shaw’s writing compelling and entertaining, and the ending made me smile with satisfaction!